Once up a time, there was a gardener named Sunny who had a beautiful garden. Sunny had carefully picked all the plants for her garden so that from early spring to late fall there were always perennials, biennials and annuals blooming. She had planned it so that the paths gracefully lead visitors through the garden from one surprise to another. It was almost magical how the dappled shade of the trees seemed to always be in just the right spot. And when anyone stood in the garden with their eyes closed, they could still tell they were in a garden by the sounds of the nearby fountain and the songs of the birds as they sang to one another. Sunny loved her garden, but had a nagging feeling, a hunch, that it was somehow incomplete. She just couldn’t quite put her thumb on what was missing. Then one day Sunny was sitting on a bench in the garden, deep in thought trying to figure out what was missing, when out from beneath a nearby shrub hopped Bountiful Bunny. Sunny did as instructed and just as she lifted the branch, she felt a little push on her backside and suddenly found herself on the other side of the shrub in another garden with Bountiful. “We are in a vegetable garden,” said Bountiful. “Sure you know how to grow vegetables, Sunny! They’re just plants like flowers are!” said Bountiful, as he began to show her around the garden. Slowly, they went from one plant to another as Bountiful explained that all the vegetables came from plants, and the plants were easy to grow. He showed Sunny how some cucumbers grow on vines that need support, like an ornamental vine, but others stay small like a sprawling shrub and can be grown in a container. He had her taste the cucumbers that were so much better than anything she’d ever bought in a grocery store. Together they looked at the rows of beans, and Bountiful explained how easy they were to grow from seed. Sunny balked a little about eating a raw green bean, but tried it anyway and agreed it was very good. She marveled at the corn and how sweet it was when Bountiful cooked an ear for her right there in a vat of boiling water. It was so sweet that Sunny didn’t even need butter on it! And so they proceeded from vegetable to vegetable while Bountiful patiently explained that they were all just plants, and offered her a taste of each one. He assured Sunny that if she could grow flowers, she could grow vegetables, too. Finally, Bountiful and Sunny came to the center of the garden where the tomato patch was. By now Sunny was nearly overcome by all the wonderful vegetables she had been tasting, each one better than any she had ever tasted, and almost instinctively she reached out to pick a ripe red tomato and taste it, too. “Oh, Bountiful, if this tomato is half as good as all the vegetables I’ve tasted so far, I’m ready!” exclaimed Sunny. So Bountiful gave Sunny his blessing to eat the tomato because he knew that she really was ready to grow vegetables. He knew she would never view her garden in the same way again. He had completed his mission. Then Sunny closed her eyes and bit into the tomato. She tasted the warmth of the sun in the flesh of the tomato and felt the juice drip down her chin. It tasted so different from any tomato she had ever bought in a store. She smiled with delight, slowly opened her eyes and was surprised to find that she was back in her own garden, sitting on the bench in the dappled shade, holding a half-eaten tomato. She wondered where the tomato had come from, but suddenly put her thumb on what was missing from her garden. Vegetables. Yes, vegetables! From that season on, Sunny always included vegetables in her garden, anyway she could - in containers, in raised beds, mixed amongst the flowers, even in a traditional row garden. And she gardened happily ever after! This could also be considered a cautionary tale! A story where the bunny isn't the villain - how novel. I love a story with a happy ending. This would make a great children's book! "Bountiful Bunny and the Vegetable Garden" is sure to be a hit! It sounds to me like Sunny got a hold of whatever Alice was taking. Vegetables are a good thing. Just like this story...and the vegetables grew happily ever after. Cute story. I agree,it would make a great children's book and might encourage children to try vegetables. Each book could include a coupon for a package of seeds to encouage growing vegetables and eating them. Go for it. Mr. McGregor's Daughter: I bet the bunny's a villain in the sequel. You realize that the Bunny is just trying trick poor Sunny into planting veggies so "Bountiful" can have more bounty. Never trust those cute fury creatures and the big bunny eyes, they're evil. A lovely story. In my case things went the other way round. I was a vegetable gardener until I met an inspiring flower gardener. I guess the point is there is a special pleasure in having both. I'll read it to Harvey & Gaby tonight. A lovely story...I agree it would make a great children's book. It certainly has an element of a cautionary allegory. Maybe it was the love apple which tempted our forebears with a knowledge that, once tasted, could never be forgotten. 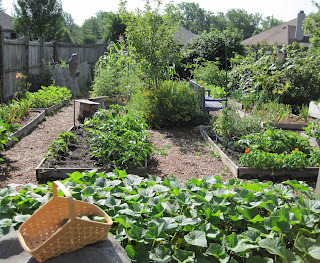 Are there really people who shy away from growing vegetables because they think they can't? I mean--did you write this story in response to question or discussion you had with actual gardeners? Amen to that Carol! What a lovely tale. However small, and in spite of its having not quite enough sun, I'm absolultely delighted to finally, once again have a veggie garden.